Fujian Province, whose capital is Fuzhou, is located on the south coast of China’s east coast. It is spread over approximately 120,000 km² and the population is estimated at just over 35 million. Because of its proximity to Taiwan, close relations have been established as there is an incessant flow of people between the two provinces. The fame of Fujian comes partly from its fruit production. The cultivation of lychees, oranges, pineapples or olives plays a major role in local economic development. Tea and medicinal herbs are also produced in this region of China. Of course, fishing is highly developed along the coast and seafood has become a key element of local cuisine. Over the years, an interesting story has developed in Fujian Province. Indeed, multiple ethnic groups have settled there and the cultural sites are now numerous. Fuzhou and Quanzhou are home to many historical sites. Of particular note is the magnificent Nanputuo Temple, one of the four most famous Buddhist temples in China, on Gulangyu Island near Xiamen. However it is especially for the beauty of the landscapes that one will recommend to visit Fujian. To the north, the Wuyi Mountains Nature Reserve will offer hiking enthusiasts the opportunity to explore a fabulous mountain range. For total cultural immersion, dive into the heart of the Hakka community in Yongding County. 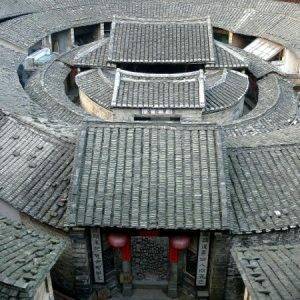 Their round houses, called Tulou, which are centuries old, stir the curiosity of all. For your trips within the province, we advise you to take the buses connecting one city to another. It is a rather cheap solution compared to the plane. Traditional railroad tracks will slow you down more than anything else as they often pass through the mountains but recently, high-speed trains have been installed and connected to Shanghai. It is today the most comfortable means of transport. When to travel to Fujian? To summarize the climate of Fujian province, it can be said that it is rather good throughout the year, between 15 and 25°C on average, but the humidity is very high. The showers are more frequent in summer and autumn and sometimes lead to torrential rains. So prefer the spring season for your stay. You will find more detailed information on the climate of Fujian on the page: Weather Fujian.